If you are learning how to make apple salad recipes, you can combine the fresh crisp flavor and texture of the apple with the great flavor of celery, carrots, salad greens and many other fruits and vegetables. When trying to decide how to select apples for apple salad recipes, it is a matter of personal preference for the most part. I like crispy apples when serving raw as in salads. Although tart or sour apples are generally recommended for cooking, there are some salads like spinach apple salad that I prefer to use these in over the sweeter varieties. For other salad recipes like the Waldorf salad recipe, I like a sweeter variety like Red Delicious. The perfect apple for using in the raw form blends sweetness, tartness, astringency and crispness; this is taste. Because taste is so subjective and because apple varieties vary so much it is a good idea to learn as much as you can about the ones available to you in your area. Experiment with the different tastes and textures and decide for yourself which ones you prefer for various recipes. Learn how to make creamy apple salad recipes like this carrot apple salad, I prefer the sweeter varieties; red or golden delicious are good. In a medium size salad bowl, combine the carrots, apple and raisins; Salt and pepper lightly. Combine the cream, vinegar and sugar; mix and toss with carrot apple mixture. 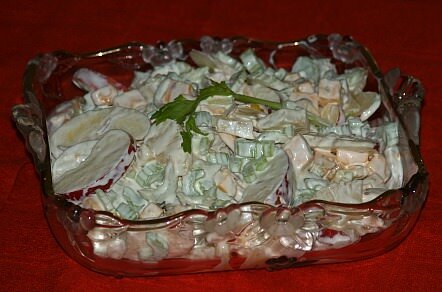 You can learn how to make apple salad recipes adding meat is added like this apple chicken salad recipe, either sweet or tart crisp apples can be added; both adding a delicious flavor. Mix chicken, celery, apple, onion and cucumber together in a medium size bowl. Whip the cream until stiff; blend in the mayonnaise, curry powder. Salt and pepper. Fold the dressing into the chicken mixture; fold in the almonds. Any of the apple salad recipes can be spiced up a little with the “spicy walnuts” that goes with the following recipe. The recipe is below. Combine the lettuce, apple and cheese; set aside. Combine the vinegar, oil and mustard; whisk well. Pour desired amount of oil and vinegar over the salad and toss to coat. Add spicy walnuts to salad and toss gently again; Serve immediately. Combine first 5 ingredients. Add walnuts and stir well. Place walnuts on a baking sheet and bake 15 minutes. Cool completely. How to select apples for many apple salads like this spinach apple salad is a matter of personal preferences; try different ones. Combine all ingredients except spinach; break spinach into bite size pieces. 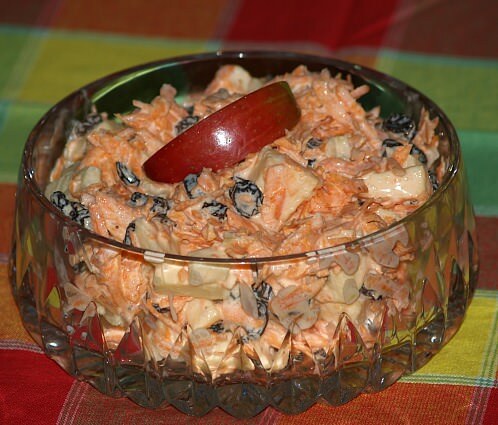 Many apple salad recipes like this apple cheese salad are good enough to serve as desserts. Combine in mixing bowl apples, celery, pineapple, cheese and almonds. In another small bowl combine sour cream and mayonnaise and blend well. Pour cream mixture over apple mixture; gently toss to mix and chill 1 to 2 hours. Serve on lettuce lines salad plates. 8 to 10 servings. Some apple salad recipes are delicious when frozen such as this frozen Waldorf salad recipe. Mix together eggs, sugar, lemon juice, salt and pineapple juice; cook over low heat stirring until slightly thickened; about 20 minutes. Remove mixture from heat and cool; fold in mayonnaise. Combine drained pineapple, apples, celery, nuts, marshmallows and mix well. Whip cream in chilled bowl until stiff; fold into cooled egg mixture. Pour mixture over fruit mixture and toss to coat; pour into a 6 cup mold and freeze until firm 3 to 4 hours.